The progress made on the trade talks was “tremendous” and “important,” the U.S. and China said. That wasn’t enough for Asia’s stock traders. In fact, now the only certainty is that they’ll have to wait longer to hear anything concrete. Trump said there’ll be no final deal until he meets with his Chinese counterpart to discuss the more contentious points, without specifying a date. Keep in mind the deadline before the U.S. slaps more than double tariffs on $200 billion in Chinese imports is now just a month away. Sure, China promised to “substantially” expand purchases of U.S. goods, and the Xinhua News Agency called the latest round of talks candid, specific, and fruitful. But what exactly is progress, wonders Margaret Yang, a strategist at CMC Markets Singapore Pte. Now we’ll have to wait until mid-February for the next episode in the trade-talks saga, when U.S. Treasury Secretary Steven Mnuchin and Trade Representative Robert Lighthizer visit China for another round of discussions. The MSCI Asia Pacific Index was little changed at 4:46 p.m. in Hong Kong on Friday, taking a pause after the “Powell Put” propelled it to its best monthly surge since March 2016. For U.S. stocks, it was their best January in 30 years. 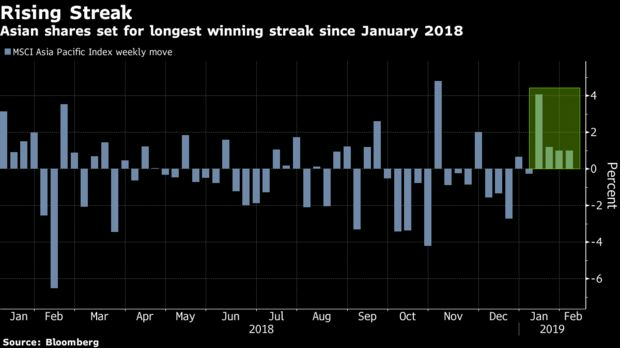 It’s also thanks to the Fed that the Asian benchmark is heading for a fourth week of gains, the longest streak in a year. Trade talks have been a point of focus and hope as the global economy signals a slowdown. Data from China showed on Friday that factories had their worst result since 2016 in January, while Indonesia’s manufacturing slipped into contraction -- Nikkei PMI readings deteriorated across several key markets, including Taiwan and the Philippines. In South Korea, exports fell again, with those to China, its biggest market, sinking 19 percent. In the U.S., the monthly jobs report is due Friday, although there is some debate over its potential market impact given the Fed’s move this week to a more patient stance, according to Michael Every, head of Asia financial markets research with Rabobank. Same with the ISM manufacturing data, also due Friday. On the earnings front, it’s been painful for hundreds of Chinese companies unveiling a deterioration in profits -- some 440 firms on Wednesday alone, according to data compiled by Bloomberg. In Japan, Honda Motor Co. reported third-quarter earnings that trailed estimates, and Sony Corp. cut its revenue forecast for the year. Stateside, Amazon.com Inc. was the latest to offer a muted sales outlookamid concerns of slowing retail growth, rising costs and uncertainty for its business in India. Shares tumbled as much as 5.8 percent in extended trading. Watch out for Exxon Mobil Corp. and Chevron Corp. coming out later Friday.